"There’s nothing like the highland air first thing in the morning," Dundee McBear roared. "It gives me an appetite and craving for some fish. I think I’ll go down to the loch and catch a salmon on two for breakfast." The bear headed through the woods towards the deep loch. He spotted somebody in the water near the shore. "What’s this?" Dundee hid behind a rowan tree and watched the man. "Why, he’s taking a bath in the loch! How am I going to catch my fish now?" The man splashed about in the water, humming a highland tune. Dundee smiled. He had an idea. He crept through the fern and bracken, his paws crunching twigs and leaves with each step. "Who’s there?" the man shouted, hearing the noises. Dundee stopped, throwing himself against a large oak tree. "I’d better be quiet," the bear whispered to himself. Soon the man, after hearing no more noises, went back to his bathing. Dundee tiptoed towards the loch, being very careful not to step on twigs or make noises. He spotted the man’s clothes lying across a black currant bush. "Hee hee. I’ll take his clothes. Hee hee," Dundee giggled. When the man had his back toward Dundee, the bear ran up, grabbed all the clothes and shoes up in his big furry arms and ran back into the woods. He sat on a rock and giggled again. "Hee hee. Wait till he gets out of the water and sees he’s got nothing to put on. Hee hee." Dundee looked at the clothing. "What have we got here? Och, there’s a kilt, a shirt, vest, socks, shoes and what’s this?" He picked up a set of bagpipes. "What in the world is he carrying around a set of bagpipes for?" Dundee put them to the side and slipped the kilt on. "Fits perfectly." Everything else went on easily. "Well, I look quite smashing in my highland dress." "Where’s my clothes?" the man shouted. Dundee turned and looked at the man. He stood dripping wet, with nothing on. "Who took my kilt?" he shouted again. "I’m freezing!" Dundee laughed at the shivering man. "When I find out who took my things, I’m going to skin them alive!" Dundee knew he’d better get out of there quickly. He grabbed the bagpipes and ran into the woods, all the way around to the other side of the loch. "Och, there’s MacDow Castle. They must be having a ceilidh today. It’s all lit up and full of people and is that neeps and tatties I smell, and haggis too?" Dundee headed towards it. He was curious and hoped he’d be able to sneak a plateful of food. "Pardon me. Are you Angus McBrew?" a voice said. Dundee turned around. "Are you Angus McBrew, the famous bagpipe player?" the man asked again. Dundee stood still, not knowing what to say. He nodded his head yes. "We’ve been expecting you. Everybody’s come from all over the land to hear you playing your bagpipes today. You’re not quite what I expected, but please come in. Lord MacDow’s waiting." 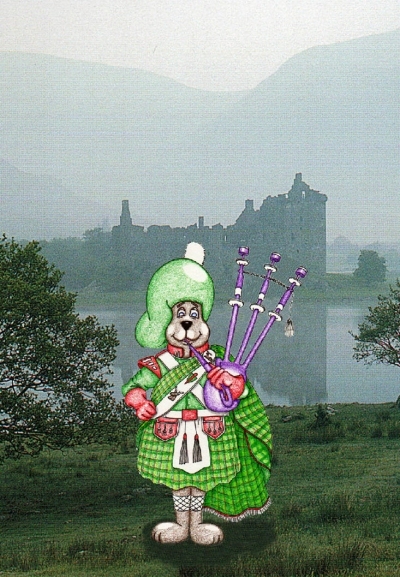 Dundee glanced down at the bagpipes he held in his paws. He followed the man into the castle. He had never been in a castle before. The walls were made of huge stones. Torches were lit and hung on the walls. When they went into the main hall, Dundee gasped. Tables were lined up from wall to wall and each was covered with food. "Wait here, McBrew while I go and find Lord MacDow." The man went out of the room, leaving Dundee with the food. The bear walked between the tables, drooling over everything. He picked up a sausage roll and shoved it in his mouth. "Delicious!" He helped himself to blackberry tarts, raisin scones, Cornish fudge, gammon steaks, meat pies, pasties and shepherd’s pie. He’d just put a piece of creamy tablet into his mouth when the man came back into the room. "Angus McBrew, this is Lord MacDow." Dundee wiped his paws on the kilt as Lord MacDow approached. "I’ve heard a lot about your bagpipe music. Today we are having festivities as part of the anniversary of this castle. We’ve got the best of everything here, including you." Dundee patted his bagpipes. "The ballroom is full of guests. Would you mind coming in and playing us a tune or two?" he asked the bear. Dundee nodded and followed Lord MacDow into the ballroom. There were at least three hundred people in there. They were sipping wine and chatting with each other. "Everybody, could I have your attention. Today we are honored to have in our castle, Scotland’s greatest bagpipe player, Angus McBrew. He’s going to play a tune for us now." Everyone began to clap. Dundee walked up to the front of the room and stood. He picked up the bagpipes and looked at them. He didn’t have any idea how to play them. All the women were smiling at him, so he knew he had to do something quickly. He put the horn piece in his mouth and held the bagpipes under his arm. SCREECH! SHRIEK! SCREECH! SHRIEK! SCREEEEEEEEEEEEEEEEEEEEEEECH! Everybody put their hands over their ears as Dundee blasted away. He started to enjoy it and moved around the room squeezing the bagpipes and blowing. He reached the back of the room when suddenly the man who was bathing in the loch came bursting through the door. "You! You stole my kilt and my bagpipes!" "Excuse me, sir. Who are you?" Lord MacDow asked. "I’m Angus McBrew. I was bathing in the loch, trying to freshen up, when this bear came along and stole my clothes." "Look at him. He’s hairy and has paws. He’s a bear, not a bagpiper!" Angus shouted. "He can’t play the bagpipes. Just listen to him. He sounds like a wildcat!" Lord MacDow looked at Dundee. "He’s just a Highlander. They’re known to be a wee bit on the hairy side. Remove this man!" he shouted. Two guards came and took Angus away. "Now, McBrew, will you continue playing for us," Lord MacDow smiled. "I’m enjoying your bagpiping." Dundee shrugged his shoulders and began to play again. SHREIK! SCREEECH! SHREIKKKKKK! SCREEEEEEEEEEEEEECH! It was the best ceilidh that Castle MacDow had ever known. Dundee spent the entire day and well into the evening feasting on his favorite foods and playing the bagpipes in his kilt.